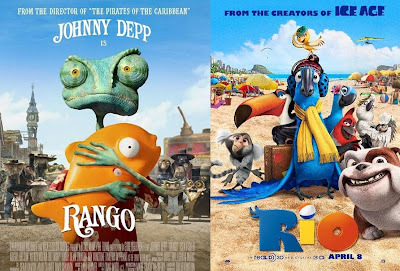 Babblings of a Mommy: Rango vs. Rio: Which One's Better? Rango vs. Rio: Which One's Better? We've been fighting non-stop about this at my house (haha). My husband enjoyed Rio, but preferred Rango. I found Rango to be a total snoozefest and enjoyed Rio much better. Scratch that--I loved Rio!! The colors were so bright and vibrant, and the movie was fun beginning to end (unlike that boring, Rango..just sayin'). So what do you think? I want to settle this once and for all! BTW, I was able to find the first 2 mins of Rio for those who haven't seen it yet. Here's a trailer for Rango for those of you haven't seen it either. I really enjoyed Rango better. Although I think there were some parts that were appropriate for children. I agree. They showed some things that was completely unnecessary and some of the scenes were a bit scary for little ones.